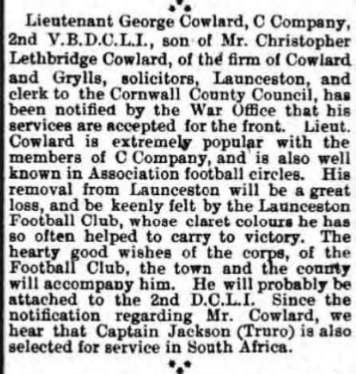 The bio of Edward George Cowlard | Launceston Then! 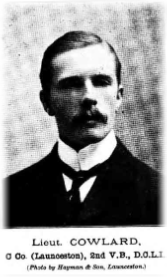 Edward or George as he was known, was born in 1878 to Christopher L. and Anna G. Cowlard at Exeter. 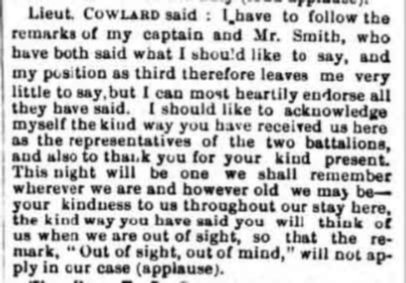 His father was a well known solicitor of Cowlard, Grylls and Cowlard in Launceston. He was educated at Marlborough College and on completion of his education he was employed by Cornwall Council as Clerk of the Peace. His name is commemorated at Marlborough College and at Truro Cathedral, South-west Tower Memorial DCLI.